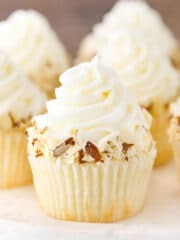 These Almond Amaretto Cupcakes have a moist almond cupcake, almond frosting and a fluffy white chocolate amaretto center! So Christmas Eve night, something rare happened. The hubs baked with me! It was sort of unintentional. We’d gotten into bed and were ready to go to sleep, but then all of a sudden I realized I’d forgotten to put together the overnight breakfast casseroles for Christmas morning. I’d prepped some things, but they still had to actually be put together. When I told the hubs, he got up with me to help so it went faster. I put together the egg casserole and the hubs put together the birthday cake one. He felt like I shouldn’t have to put together my own birthday breakfast. 🙂 After a few minutes of putting things in bowls, he got confused. “Wait, what’s this?” he said, pointing at the recipe. “That’s tablespoons. Five tablespoons of sprinkles,” I said. “So what’s this?” he said. He’d added 2 tablespoons instead of 2 teaspoons. Quite a difference. 🙂 Fortunately, it’s hard to mess up a birthday cake french toast casserole. The more cinnamon and vanilla, the more better. We had a good laugh and rolled with it. These cupcakes are seriously delicious and were made by request. 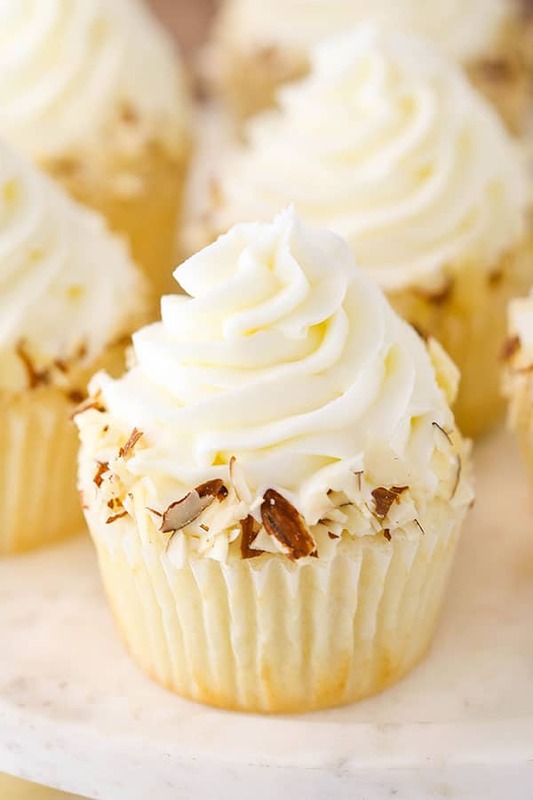 The base cupcake is moist and fluffy and uses almond extract for the flavor. The first step of the process of making the batter is the most important – the creaming. Be sure to fully cream the butter and sugar together until it’s lighter in color and fluffy in texture. You’ll be able to see it change. It adds air to the batter that gives the cupcake it’s fluff. The frosting is a classic american buttercream, also flavored with almond extract. If you’re feeling the amaretto though, you could totally add some of that in there too, in place of the water or milk. I like to use a combination of butter and shortening in the frosting. I prefer the texture and flavor and it stays firmer at room temperature, but if you would prefer all butter you can just replace the shortening with additional butter. 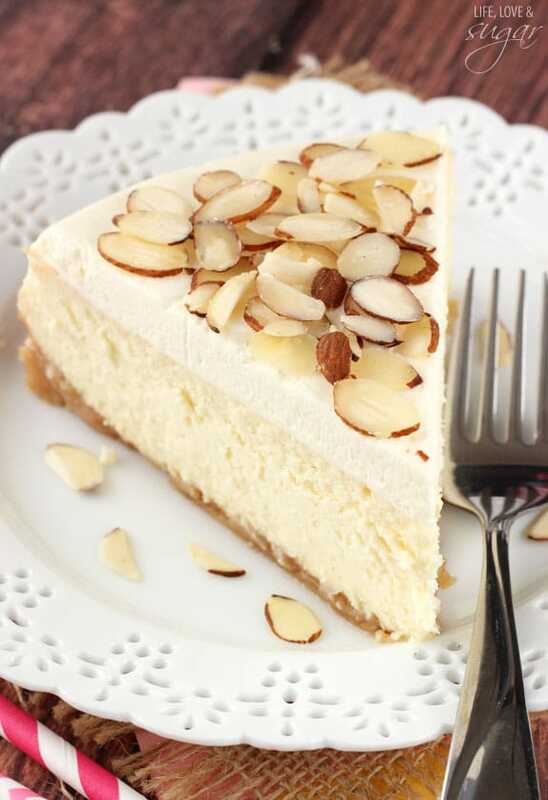 The filling is flavored with amaretto, an almond flavored liqueur. 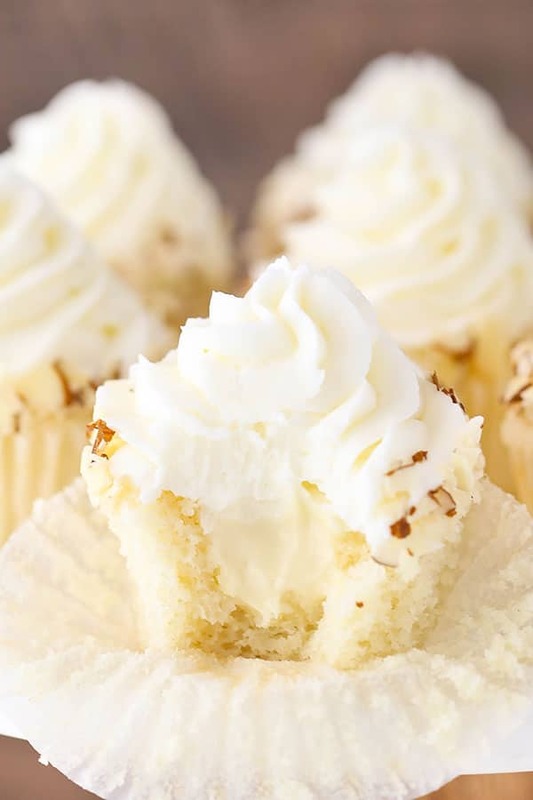 It’s a whipped white chocolate ganache that’s so light and perfect with the cupcake! To make the ganache, heat the heavy whipping cream and amaretto, then pour it over the white chocolate chips. Whisk them together until smooth, then refrigerate until it has firmed up. It will still be a little soft, but firm. Add the ganache to a mixer and bowl fitted with the whisk attachment and whip until soft peaks form, about 5-7 minutes. You’ll notice the color of the ganache lighten. 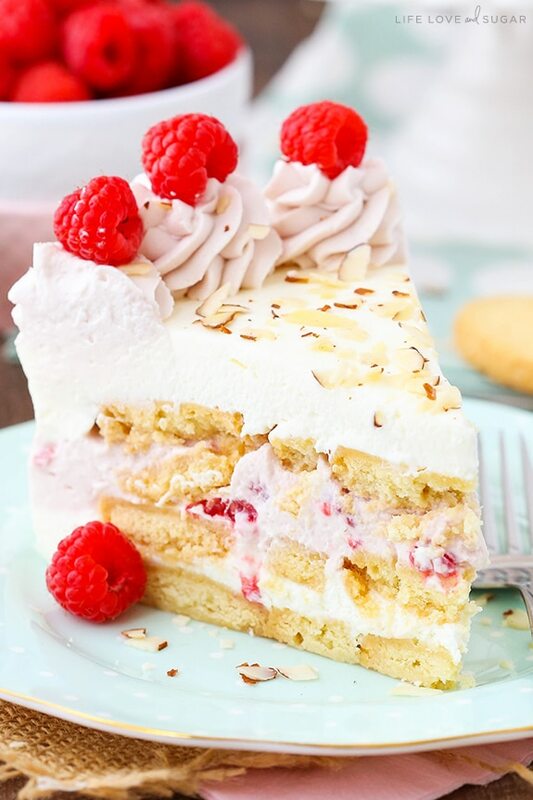 It’s light, fluffy and SO good! 1. To make the ganache, put the white chocolate chips in a medium sized bowl. 2. Put the amaretto and heavy whipping cream in a microwave safe measuring cup or bowl and microwave until it begins to boil. 4. Set the ganache in the fridge to firm up, about 2-3 hours. 5. To make the cupcakes, preheat oven to 350°F (176°C) and prepare a cupcake pan with cupcake liners. 6. In a large mixing bowl, cream butter and sugar together until light in color and fluffy, about 3-4 minutes. Do not skimp on the amount of creaming time. 7. Add sour cream and almond extract and mix until well combined. 8. Add egg whites in two batches, mixing until well combined after each. Scrape down the sides of the bowl as needed to be sure all ingredients are well incorporated. 9. Combine dry ingredients in a separate bowl, then combine the milk and water in a small measuring cup. 11. Fill the cupcake liners about halfway. Bake for 15-17 minutes, or until a toothpick inserted comes out with a few crumbs. 12. Remove cupcakes from oven and allow to cool for 2-3 minutes, then remove to cooling rack to finish cooling. 13. While the cupcakes cool, finish the ganache. Put the ganache in the bowl of a mixer and whip with the whisk attachment until soft peaks form, about 5-7 minutes. You’ll notice the ganache lighten in color. 14. Cut out the centers of the cupcakes. You can use a cupcake corer or a knife. 15. Fill the centers of the cupcakes with the white chocolate ganache. Set the cupcakes in the fridge while you make the frosting. 16. To make the frosting, combine the butter and shortening with a mixer until smooth. 18. Add 3 tablespoons of water or milk and the almond extract to the frosting and mix until well combined. 19. Add remaining powdered sugar and mix until smooth. Add additional water or milk as needed to get the right consistency. 21. Press broken sliced almonds onto the sides of the bottom of the frosting. Refrigerate cupcakes until ready to serve. Serve at room temperature. 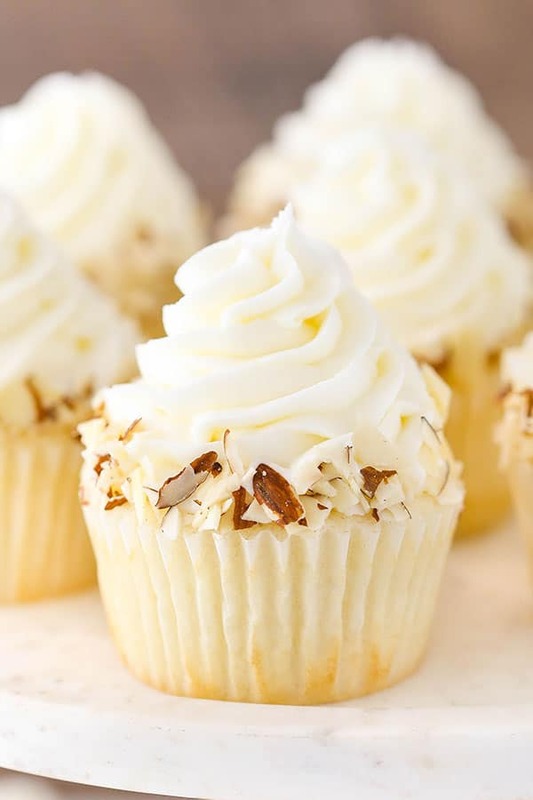 To make the cupcakes non-alcoholic, leave out the amaretto in the filling and use 5 1/2 tablespoons of heavy whipping cream and 3/4 teaspoon of almond extract. 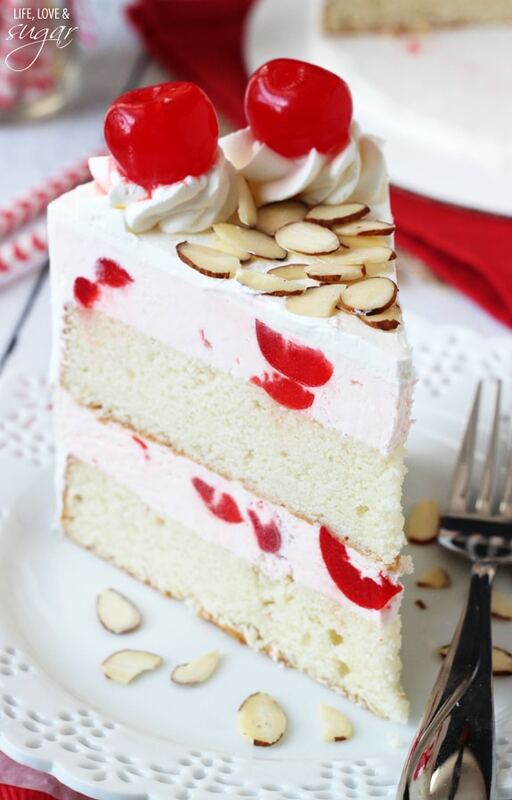 Nice list of recipes would like to make Cherry Almond Amaretto Ice Cream Cake at home. I will need to take the help of Mom. Yay! I can not wait to make these! I am getting my grocery list together right now! I am way too excited! Thank you for posting these yummy cupcakes! So! I made these today and OH MY WORD!!!!!! They are even better than the bakery!!! You way out did yourself!!! Thank you so much for coming up with the most AMAZING cupcake EVER!!!!!!! Yay!!! 🙂 That’s wonderful! I’m so glad you enjoyed them! 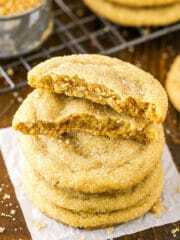 I’ve avoided baking since Christmas, too many cookies still in the house, but this recipe I will make and bring to work asap. It sounds sooo delicious! Ha ha! Bless his heart! That reminds me of the time my husband made a batch of cornbread that was so bitter and chemical tasting that I tricked the people at work into tasting it just so I could see them make yucky faces. It wasn’t until years later, when he asked me the difference between baking powder and baking soda, that I finally figured out what had gone wrong. A tablespoon of baking SODA had gone into that loaf of cornbread. Good thing your husb put too much cinnamon and vanilla, like you said. 🙂 And that was incredibly sweet of him to help you. Omg, yes! Mixing up baking soda and baking powder is MUCH more detrimental to a recipe. 🙂 Too funny! And yes, he’s a very sweet man. 🙂 Thanks Erin! Oh my goodness! 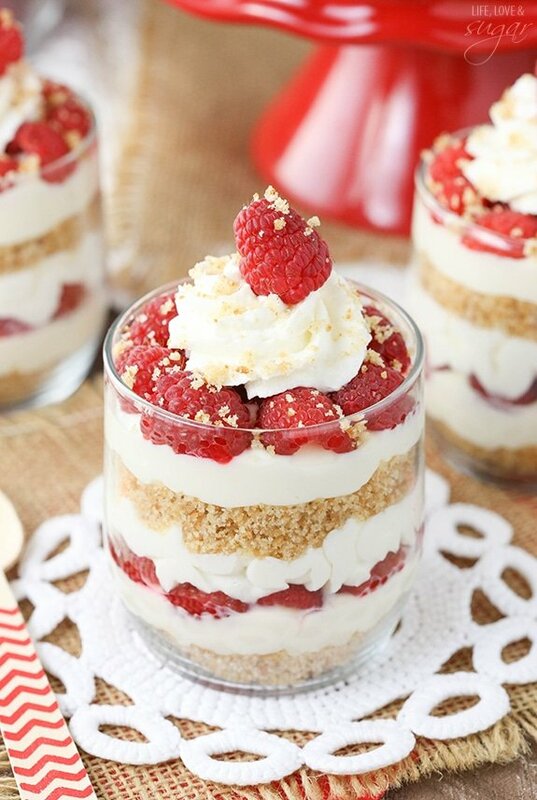 I Love Love Love amaretto so these will definitely be on the cooking/baking list this weekend! They look delicious, thanks for sharing! Would it make a difference if I use almond extract instead of the Amaretto in the filling? There’s a note at the bottom of the instructions about removing the amaretto from the filling – if that doesn’t clarify it, let me know. 🙂 Thanks! Thank you! I did not see that the first time I looked at the recipe. 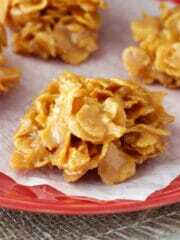 I will be making these soon!!! I enjoy your site!! 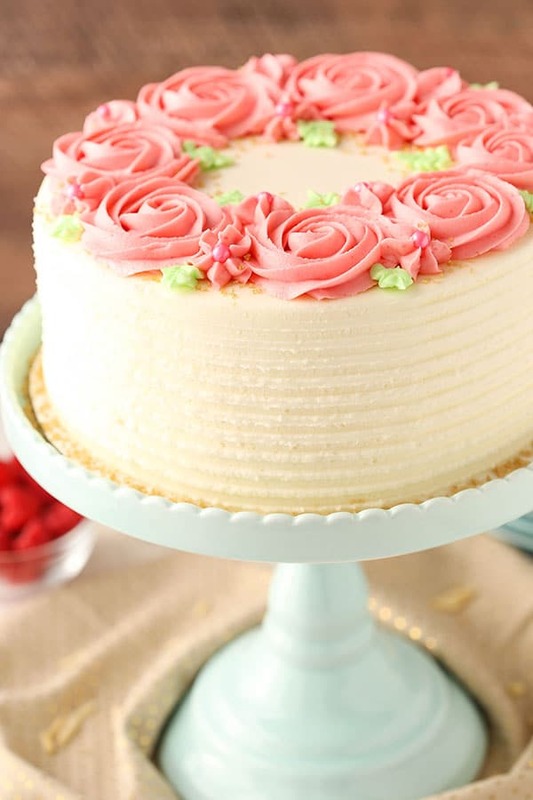 Could I add red food coloring in order to turn the frosting red? Also, could I make the ganache the night before I make the cupcakes and frosting? These sound so delicious! I’m wondering if you could tell me how much amaretto to use in the cupcake batter instead of putting it in the filling/frosting. I like the flavor, but want to have it in the baked part and not the unbaked for those not interested in the alcohol part. And if omitting it from the filling or frosting, how much almond extract would I use instead? Thanks so much! Hi Heidi! I added to the note at the bottom of the recipe about making the filling non-alcoholic and adding almond extract. For the cupcake, here’s the suggestion (though I haven’t tried them this way, so no guarantees. 🙂 ) – reduce the sour cream to 1/4 cup (4 tbsp) and use 1/4 cup (4 tbsp) of milk and 6 tbsp of amaretto. Just the title is making me want this! I can’t wait to try this cupcakes out, thanks for sharing. I can’t wait to make this! Thank you for sharing…and what a sweet husband! Where did you get the pedestal cake plate…the one with the wood base? Thanks Camille! I hope you enjoy them! The cake stand is from Home Goods. Your dessert pics are so pretty they bring a tear of joy to my eye! And I’m an Amaretto loving queen, so these have my full attention. (I blurbed about them on my Chew Your Booze blog.) Can’t wait for more of your alcohol-y baked goods! In the frosting? Yes, just replace the shortening with more butter. Just made the almond amaretto cakes yesterday, and they are beyond delicious. 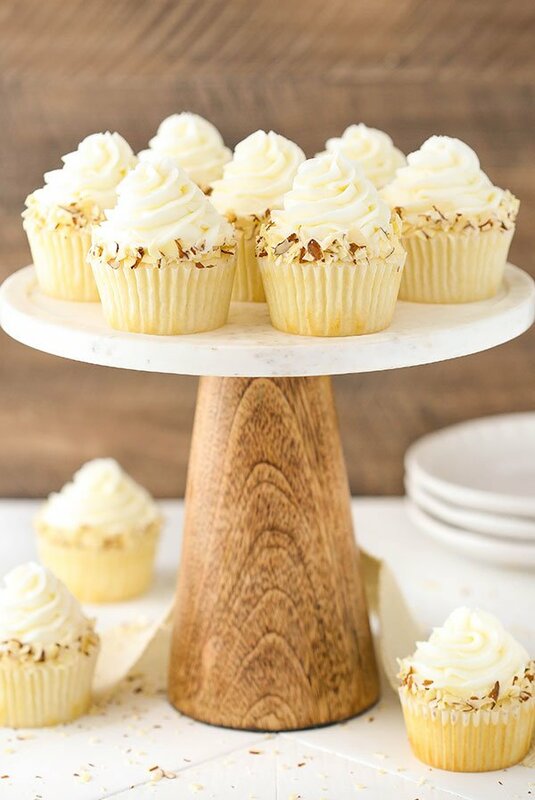 Light, fluffy and the perfect hint of amaretto flavor. My daughters and I had just sampled some cupcakes from a cupcake specialty shop in the Twin Cities area and these would be a hit there. Thank you for sharing this delicious recipe. Yes, storing them in the fridge is best. I’d say the cupcakes are best for 3-4 days. Would it be OK to make these a day before? I plan on bring them to a party but don’t know how much time i will have the day of! Can i omit the amaretto liquor and use the amaretto flavoring syrup used for coffee and it so how much should i use? I haven’t tried it. I’d try it as a 1:1 swap. Hi! I was wondering if you used the amaretto flavoring syrup used for coffee for the filling in the cupcake, and if so, how did it turn out? Thanks! These look SO amazing! But I’ll be honest and say I am a layer cake girl. Have you ever tried this recipe in cake format? Have you ever doubled it (in making cupcakes)? 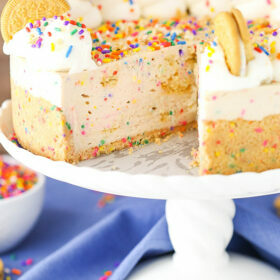 I am very inspired by your recipe, would love to hear if you or anyone else has made it as a layer cake. Thanks for sharing! Yes, you’ll want to double the batter for a cake. I usually bake it in three 8 inch pans for about 21-23 minutes. I’m guessing you’ll need to double the filling, but it could be that you need more like 1 1/2 recipes worth. Not sure. The filling is relatively soft, so you’ll need to pipe a dam of frosting around the cake before you add the filling. Depending on how heavily you frosting your cakes (I’m fairly heavy-handed. 🙂 ) You may want to double the frosting – or so. I hope that helps! Hi! I made these as cupcakes as they turned out so well! Everyone was raving about them! I would like to make the same recipe but in cake form. Do you have any idea how this would translate into cake pans? Would you recommend doubling the batter and icing? Yes, you’ll want to double the batter for a cake. I usually bake it in three 8 inch pans for about 21-23 minutes. I’m guessing you’ll need to double the filling, but it could be that you need more like 1 1/2 recipes worth. Not sure. 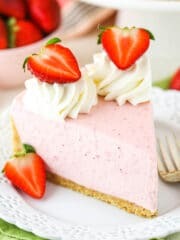 As you probably noticed, the filling is relatively soft, so you’ll need to pipe a dam of frosting around the cake before you add the filling to give it support. Depending on how heavily you frosting your cakes (I’m fairly heavy-handed. 🙂 ) You may want to double the frosting – or so. I hope that helps! Thank you so much for your answer! Really appreciate it! Hi Elena! I’m sorry you’ve had trouble. I’d love to be able to adapt things, but not knowing enough about the Russian version of ingredients, it’d be hard for me to make suggestions. Shortening is a butter substitute that can be replaced with butter. Heavy whipping cream is a high fat milk that is used to make whipped cream. I was so looking forward to making (& eating) these. I am so disappointed. This was the first batch of cupcakes that I’ve ever had deflate/collapse on me. I thought I would work with them anyway. I cored the inside and they were tacky to the touch. Like they weren’t cooked all the way but they were (I checked before pulling them from the oven). I put the ganache inside of them but didn’t even bother with the frosting because the cake itself had an unappealing flavor to it. 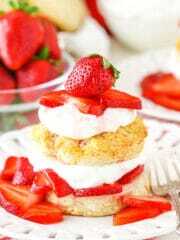 Not sweet at all, which although I did not frost, I thought the cake should taste sweet. Not happy that I wasted the ingredients on this recipe. I am going to make some almond scones and drizzle the leftover chocolate-amaretto filling on top of them. I’m sorry Shannon, it almost sounds like an ingredient was left out or off or something. These definitely aren’t tacky in texture. No, you don’t whip them first. Do I whip the egg whites before adding them?? These look delicious and I’ll definitely be making them! Though I did just want to let you know that the number of ads on your site is making it really hard for me to read the recipe and for the page to load in general. I totally understand that your ad revenue is what helps you run the site, but you might want to consider adjusting them so that the time spent on your site is enjoyable, rather than frustrating, trying to get rid of popups. There really shouldn’t be any popups. My ad management team and myself are against them so they purposely aren’t added to this site. Sometimes there’s something that can have to do with your phone or computer (I don’t know if it’s a virus or something else) that can make ads pop up that aren’t coming from my site. Maybe check into that? I don’t get any popups when I’m on my site. I’m sorry you’re having trouble with it. It’s definitely important to me that the site is easy to use. 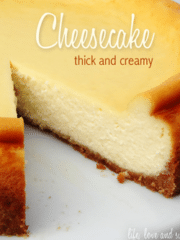 I typically don’t buy whole milk… And for baking I usually always have buttermilk, half & half or heavy cream on hand… For this recipe can I use buttermilk or half & half instead of milk (at equal amount) ? Should be fine. I’d probably suggest the half and half. can you turn the cupcakes into a cake? How would you go about making a cake? I would think so. You’d need to double the cake recipe and increase the frosting for sure. Having not done it, I couldn’t tell you exact amounts. You’d want to be sure to pipe a dam for putting the filling in, so it stays in place. 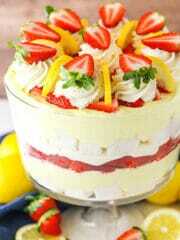 Can this me made into a layer cake? It should be fine as a layer cake. You’ll want to double the cake portion. You could use this recipe for help with the cake layers. You’ll want to double the amount of frosting or so and use some as a dam between the cake layers to hold in the filling. Not sure about the filling – it may be enough as is or you might need a little more. 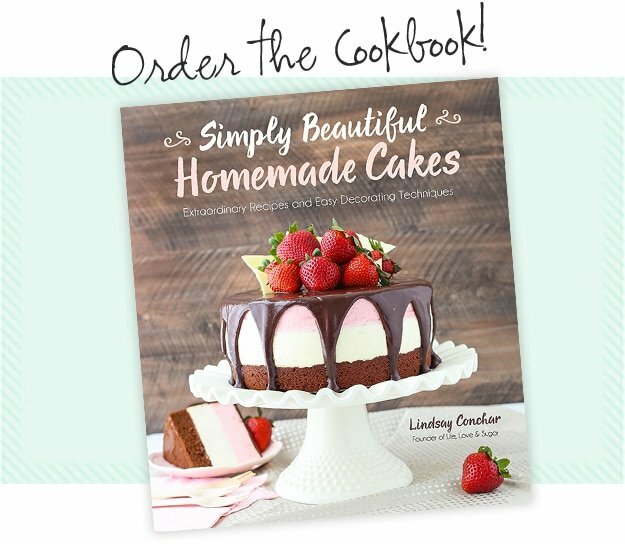 Your cupcake recipe sounds fabulous! 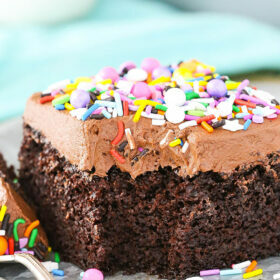 I plan on making these soon and I’m just wondering if you could suggest any certain brands of butter for the frosting? I have tried making buttercream frosting in the past but failed terribly. Also do suggest using a stand mixer or would a hand mixer work just as good for making the frosting? Thanks Nicole. I’m sorry to hear of the diagnosis. I haven’t tried gluten free flour, but I have heard from others that have tried it in some cakes that it made a good substitute. I want to make these for a party on Saturday, but I have to travel out of town for work all week and do not return home until Friday evening. Can I make the cupcakes now and freeze them, and then just ice them when I get to the party? That should be fine. Just be sure to wrap them well before freezing and then defrost in the fridge. Sorry meant freeze cupcakes and fill day before wedding? The cupcakes can be frozen. Just be sure to wrap/seal them well and defrost in the fridge. I haven’t ever frozen the filling, so I’m not sure. So it 12:40 a.m. and I’m looking for something to bring to my husband’s Christmas in the Hall luncheon. It’s the only day of the year family gets to go inside. Last year we were out of town so this year I really have to BRING it BIG. Thank you these will be a big hit. These cupcakes look exactly like a cupcake I used to be head over heels for that a local bakery used to make all the time then suddenly stopped. The only difference is, they were not stuffed but had the greatest combo of the amaretto and almond flavor ratio, Can you kindly tell me how I can make them without the filling and still get that amaretto flavor? thanks so much! can’t wait to try them! One option would be to use Amaretto in place of the water or milk in the frosting. 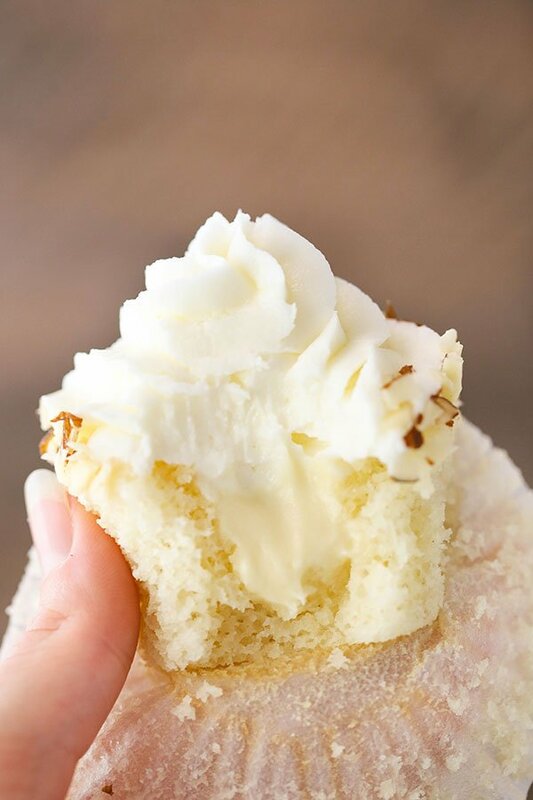 I’m hoping to make your filling for wedding cupcakes next weekend and have a few questions. The bride wants an almond mousse, would you say this would be a good filling to use? Also does the filling harden once refrigerated because of the chocolate? Thank you! For best results, I would usually suggest just freezing the cupcake itself and then making the mousse and frosting after they’ve defrosted and you’re ready to use them. I made these this morning for our Thanksgiving dessert and they were a HUGE hit! Delicious…. My husband says that they have moved up to his favorite cupcakes I’ve made, and my nieces each ate THREE of them! I loved these cupcakes, but I had an issue with the ganache. after I whipped it for about a minute the ganache hardened, it looked as though it had separated / curdled. any idea why this would have happened? Where can I find amerreto flavor? Or can I substitute with almond extract? Amaretto is a liqueur that you can buy at the liquor store. Replacing it in the filling with a little almond extract would be fine, but you’d need to then adjust the amount of heavy whipping cream to about 5 tablespoons. I made these wonderful Amoretto cupcakes for my daughter’s bridal shower. Absolutely delicious! Lots of compliments and no leftovers! Thank you for the wonderful recipe. I’ll be making these again! I took the cupcake centers and some leftover ganache and icing and mixed it together. I melted the leftover white chocolate and dipped the mixture, formed into balls, for a tasty cake pop! Nothing wasted! if i wanted to make these chocolate, do you know how much coco i would add? Which part are you trying to make chocolate? Just the cupcake? I might suggest using this chocolate cupcake. 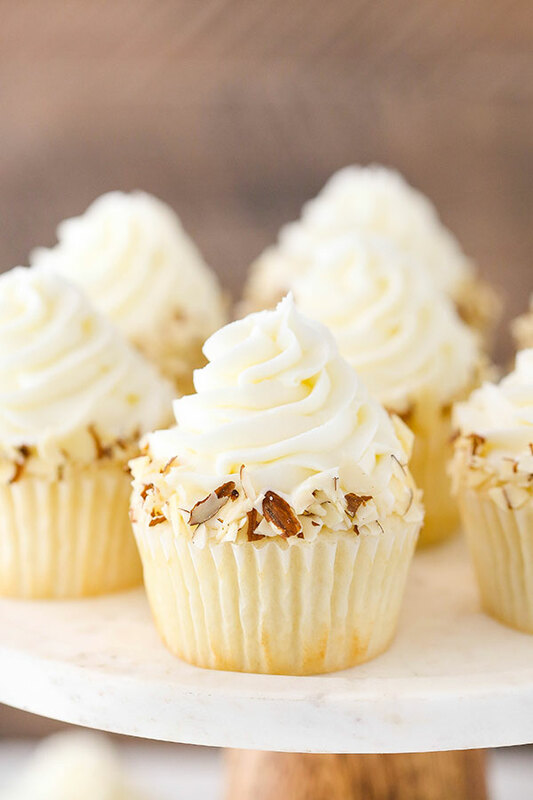 I just finished making the Almond Amaretto Cupcakes and they turned out EXACTLY like yours!! They are simply perfect. Certainly a bit time consuming but worth every second. I made them to take to a joint church service tomorrow (I know, kinda rolled the dice on making cupcakes from a recipe I have never tried before but hey! that’s how I roll!!!). Thanks for posting this recipe….now I need to go hose down the kitchen re: powdered sugar….. Awesome! So glad you were happy with them! Have you used cake flour instead of all purpose? What will the difference be? I haven’t tried it in this recipe, so I’m not sure how it’d turn out. The flours have different protein contents. Hi Lindsay – can you give me an example of what “shortening” might be. Are you referring to a product such as Crisco? Or are you referring to the shortening which comes in the tubs and looks like butter but it is not, such as Land O Lakes? Yes, the crisco shortening is what I use. Im suprised to read egg white instead of eggs (all of them) . Egg whites and yolks serve different functions in baking. 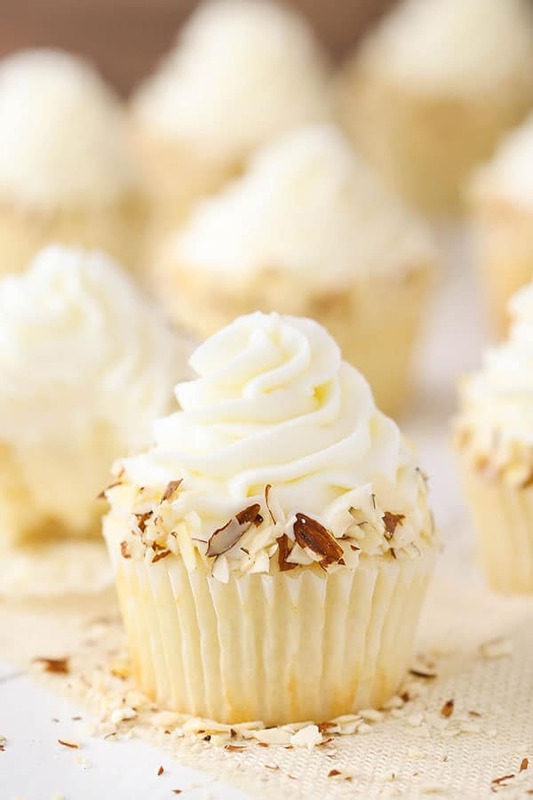 In this recipe, whites add structure to the cupcakes. What if u don’t have Sour Cream? Any substitution? You could try using additional milk. 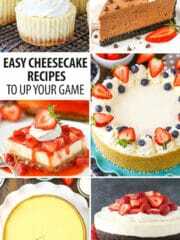 Can I use this recipe for a tiered cake or to stack? It would certainly work as a layered cake. As for stacking, I’m not totally sure. If things are well doweled and supported, I’d think it’d be fine. Hi Lindsay. Can powdered egg whites be substituted in this recipe? Also, what is the typical yield from this recipe using standard size cups? Thank you in advance. I’m looking forward to trying these. I have never used powdered egg whites before, so I really don’t know. The recipe makes 12-14 cupcakes. I made them today for a bachelorette party! They look beautiful! So glad you enjoyed them! For the frosting can I use all butter instead of shortening. Hi Lindsey! 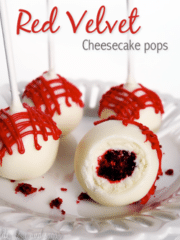 These look and sound amazing but I have celiac and need to make them gluten free. Do you think I can sub gluten free flour will work or almond flour? Has anyone made them gluten free? 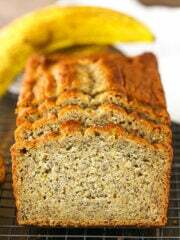 I haven’t tried gluten free flour, but I have heard from others that have tried it in some cakes that it made a good substitute. What do you think about using an italian or swiss meringue buttercream instead of the american buttercream? Did you test with different types? Thanks! I bet it’d be great! I didn’t try other versions myself. Do these have to be stored in the refrigerator? I would make them the day before serving. Yes, I’d store them in the fridge. Can I make the ganache the night before I make the cupcakes and frosting, would it hold up overnight? Would I be able to use food coloring on the frosting? I want to make some of them red? What’s the difference between using all butter in the frosting vs butter and shortening? Yes, you can make the ganache the night before. Food coloring will work just fine in the frosting. To read more about using butter versus shortening, check out this post. You can always feel free to use all butter, if you prefer.